Here's my entry for Saturdays Workout,, this week's theme is gesso or gessoed. It's a 4 X 4 page I did for a chunky book sometime back it was for the theme WHITE. 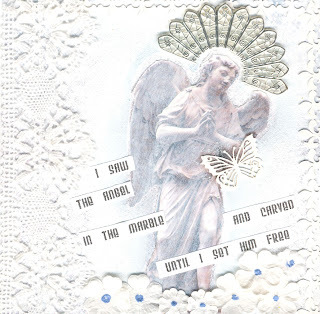 I used images by artchix studio of an angel and gessoed over the whole finished image before adding embelishments. This was the first time I had ever used gesso over any of my art work and I was little dubbious that I would ruin what I had done, but I think it came out just fine. This page is now in a Chunky White Book amongst some greyt work by some greyt mixed media artists. BE YOUR OWN ARTIST, NOT A 21ST CENTURY PIRATE ! my late entry to MMM, theme travel. 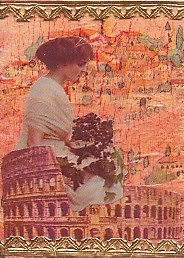 An ATC, background is the crackle technique with decoupage serviette glued on top and then vintage images. 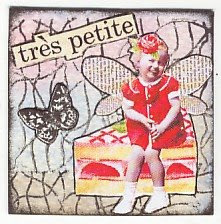 Once, Twice, Thrice.................I thought I might as well go the whole hog and make a THRINCIE as well, 3" X 3". don't know if there is another name for 3" art squared but I thought I would nominate it a THRINCIE/ THRINCY. What do you think is best? SMALL WORLD OF INCHIES challenge 'Celebration', so here they all are together. The challenge on this weeks SMALL WORLD OF INCHIES is CELEBRATION. 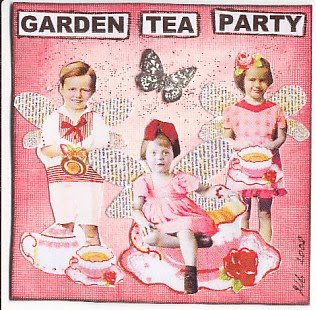 I have done a GARDEN TEA PARTY as summer is here and the British love their outdoor parties, also I have used fairy images as I also think of Shakespeare's MIDSUMMER NIGHT'S DREAM. This weeks challenge on WEDNESDAY STAMPER is TWINCHIES. What's a twinchie? well, it measures 2" X 2" double size to an inchie. 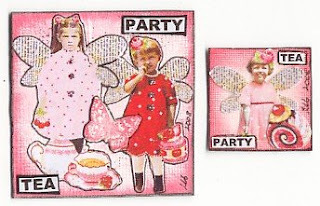 Background is with watercolours then stamped over and then a stamped butterfly and vintage image. As It's hot here in Italy I thought something colourful and summery. TRY SOMETHING NEW is the challenge on MIXED MEDIA MONDAY today. Here's my contribution, this double page LO is for a scrapbooking chunky book about me, 4" X 4", well it's ages since I've really done any scrapbooking, actually years, so I tried to do it in my best mixed media way, this is the nearest I could come up with, to try and keep it to how their taste as, my mixed media isn't usually girly wirly, flowery, colourful enough. I tried a new acrylic paint with micro pearls inside , same consitency and texture as that of a facial or body scrub, mixed it together with an acrylic blue irridescent . Lovley colour and texture but be warned ...............blinking difficult to then collage anything on top of it due the the surface not being smooth due to the micro pearls !!!!!!!!!!!!!! took me forever and a day to glue on my painted girls and writing.!!!!!!!!!!!! next time images and writing first and then micro pearls acrylic paint !!!!! learn't my lesson thanx to mixed media monday. Made these PHUNKY DOLLS last night, now to write out the patterns. Special thanx to SUZI BLU and EMILY IPOLANI who have inspired me in my work. 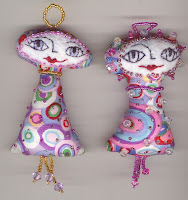 These PHUNKY DOLLS are about 4" - 6 " tall, they can be filled with sand/ grit so they stand up or you can sew on a beaded loop so you can hang them or an attachment so that you can put them on you cell phone, bag, backpack etc you can even wear them as part of a necklace, brooch. Here's my contribution to the weekly challenge on the blog MAKE A MOO OR TWO. 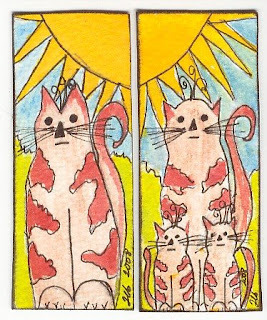 This week's challenge is CATS, my moos are handrawn and watercoloured. Look what I've found a SUZI BLU. This gal and her art rocks and her Vlogs...........wow.